↑ "Padma Awards". Ministry of Home Affairs, Government of India. 2015. http://mha.nic.in/sites/upload_files/mha/files/LST-PDAWD-2013.pdf। আহৰণ কৰা হৈছে: July 21, 2015. ↑ Chopra, Anupama (2000). Sholay: The Making of a Classic. Penguin Books India. পৃষ্ঠা. 16. ISBN 0-14-02997-0X. 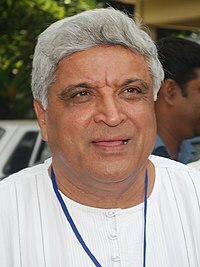 ↑ "Javed Akhtar, Dua nominated to Rajya Sabha – India – DNA". Dnaindia.com. 17 November 2009. http://www.dnaindia.com/india/report_javed-akhtar-dua-nominated-to-rajya-sabha_1312632। আহৰণ কৰা হৈছে: 3 March 2013. ↑ "26 atheists movie stars in India". jithumpa.com. http://www.jithumpa.com/entertainment/films/26-atheist-movies-stars-in-india/. ↑ "10 Self-Proclaimed Celebrity Atheists | Entertainment | iDiva.com | Page 4". iDiva.com. http://idiva.com/photogallery-entertainment/10-self-proclaimed-celebrity-atheists/21972/4। আহৰণ কৰা হৈছে: 16 December 2013. ↑ "Honey Irani on Divorce, Survival & Shabana Azmi". iDiva.com. http://idiva.com/news-entertainment/honey-irani-on-divorce-survival-shabana-azmi/13218। আহৰণ কৰা হৈছে: 3 March 2013. ↑ "Poets dominate Sahitya Akademi Awards 2013". Sahitya Akademi. 18 December 2013. Retrieved 18 December 2013.